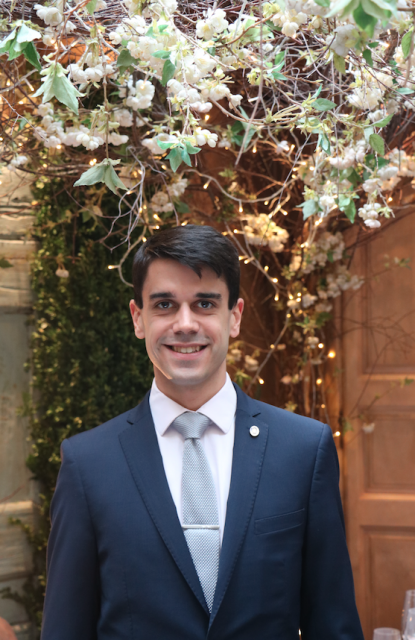 Head sommelier at London’s “most romantic” restaurant, Clos Maggiore, 25-year-old Daniele Chelo was born in Milan but has lived in London since 2015. It was in Milan that he “fell in love with hospitality” at the Michelin-starred Al Pont de Ferr, under the stewardship of head chef Matias Perdomo. “The friendly atmosphere and service really opened my eyes,” says Chelo, who was particularly inspired by Perdomo’s creative approach to cuisine. Keen to improve his English, Chelo moved back to the UK in 2015 and got his big break at Jason Atherton’s Michelin-starred City Social, where he worked his way up from junior sommelier to head sommelier in just two years. Along the way he was named a certified sommelier by the Court of Master Sommeliers. Chelo is now in charge of the wine list at one of London’s best-loved and most romantic restaurants, Clos Maggiore in Covent Garden, where he took over from former head sommelier Antonin Dubuis in July. Every person you meet on your path is always giving you something. Many people have been inspiring me and driving me in my choice. Crucial for my passion about restaurant has been my first chef, Matias Perdomo, with his incredibly creative cuisine and philosophy. And definitely if I have to mention a sommelier I would love to be he is surely Paolo Basso. Such an example for this profession. Which single bottle sparked your love of wine? It’s hard to say. I started to love wine because of the interest behind the different tasting notes and flavour expressions, but I remember my surprise at tasting Amarone della Valpolicella 2004 Trabucchi d’Illasi. I was still a newbie and I had the good luck to open this bottle and… wow. Normally a beer or a glass of wine. It depends on my mood. But nothing is missing at home. On a rainy autumnal day a nice Scotch is always lovely. I was 20 and working in a restaurant where the wine was kept on shelves on the wall. We used a telescopic clip to get the bottles from there and once I missed a bottle and it fell on the head of my floor manager. The entire room started to laugh at me. Luckily I am still friends with my manager. Probably the guests who, when you offer them a taste of wine by the glass to see if it suits their taste, answers to you “it’s fine anyway I don’t understand anything”. I have not asked you to give me a technical analysis of the wine, just tell me if you like it! Every person you meet on your path gives you something. Many people have inspired me and have driven me in my choices. Crucial for my passion for food has been my first chef, Matias Perdomo, for his creative cuisine and philosophy. If I had to mention a sommelier it would be Paolo Basso, who is such an example for this profession. Where would your fantasy vineyard be located? I would love to have one in Langhe. Every time I go there I feel so peaceful, so amazed by the landscape. The people and food just complete the dream scenario. If you know the answer please tell me because I don’t know. I might be in informatics, maybe a taxi driver? Maybe I could sell watermelon on the beach in the summer. I have to say there are many ‘normal’ people who I loved to serve so much that became some of my favourite and most memorable customers. But I have to say when you see Quique Dacosta, Massimo Bottura or Ferran Adrià entering the door of your restaurant you feel special. Would you ever like to make your own wine? Of course. I would love to have something that is the fruit of my hard work and many choices to reflect my style. I work hard to give people wines that can reflect my style and which fits my taste. It would be a dream if that wine were also to come from my hand. Just one per style: Champagne: Salon 1997; white: Puligny Montrachet Pernot Belicard 1er Cru Les Perrieres 2011; red: Hermitage Jean-Louis Chave 2002. I would recommend myself to study wine straight in school differently from what I have done. I was not ready for it, but it is a choice I have regretted. Put your passion in it and do not give up to the first obstacles or difficulties. That’s a really rewarding job and just making sacrifices you can go far.